Gertie's New Blog for Better Sewing: Pattern Shopping for Good! 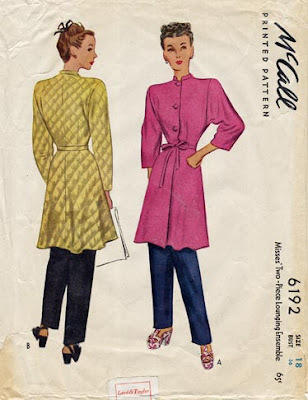 Want a good excuse to pick up some fabulous vintage patterns? Denise at The Blue Gardenia is having an excellent year-end sale. Buy three patterns or more and you get 33% off your entire order! Carolyn wrote this sweet post about Denise and helping out our community of sewists and vintage pattern sellers. It seems Denise has gone through a bit of a rough patch, as her husband's job was affected by this lousy economy. As someone who has been in the same boat, I wanted to help out too. And in this case, helping out meant getting some truly excellent new patterns! Wanna see? 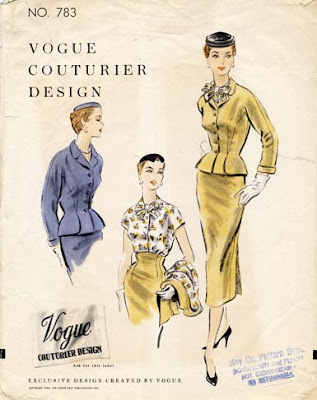 The pattern above is a Vogue Couturier suit and blouse pattern from 1954. I love everything about it. Here's a line drawing, too. Look how the skirt curves down on the lower back! I'm also thinking it could be a stand-in for Vogue S-4240, the VoNBBS suit, which has still not turned up in my relentless searches. Now look at this cool 40s frock. I just love that subtle curve at the waistline. And how about this glam two-piece lounging ensemble? I saw a quilted silk floral robe from the 40s in a vintage shop in Arizona, and I'd love to make one of my own from this pattern. Perhaps with coordinating silk pants? Also: check out the amazing shoes on the chick on the right. Okay, now go pick out some of your own! The sale lasts until January 7th. P.S. You might be interested to know that she has Vogue 7101, the sheath dress from VoNBBS in a bust 32. That's the one I made in red satin! It's a fabulous pattern. 4930 is simply stunning! Simplicity, no less--my all time favorite. Nice to know there is a resurgence in sewing. Out here in the Midwest, I've noticed an uptick. Some of the masterpieces at the 4-H county fair this year were quite classy. I don't shop Blue Gardenia. $75+ for a pattern is way out of my league. I sew because I'm thrifty and like well-made clothes. The Blue Gardenia interface is not shopper friendly either. Only a few patterns can be viewed per page, no search option and (the worst part) the patterns are on an endless loop. Which means you never know when you've reached the end of the "50s" or "60s" section. You just keep clicking and scrolling until you're dizzy from seeing one too many boleros. Those of us who are experiencing a real economic crunch this season will appreciate that http://www.voguepatterns.com/ is having a $3.99 sale on all their patterns (ends today), including vintage. I know vogue patterns don't have the same charm as working off a genuine unprinted pattern from the 40s, but hey, the price is right! I think the point of Gertie's post was that buying patterns from Blue Gardenia would help out a fellow blogger in a bad situation and that those lovely $75 patterns can now be purchased for about $50. Hooray for modern patterns being cheap, but how is that relevant? I will agree that the site could stand to be a bit more user-friendly. An option to search the patterns by measurements and type of garment would probably help her sales tremendously. That Vogue suit has your name written all over it! They are all lovely, but I think that one will be a show stopper. I have bought great vintage patterns at www.momspatterns.com , www.lanetzliving.net and www.risingfeenix.com and the owners of these sites are very nice women. As I've written about here before, prices on vintage patterns can vary widely from seller to seller, but that's not the focus of this particular post. Denise seems to really know her stuff and is a passionate pattern preservationist (say that three times fast! ), so I don't think she sets her prices willy-nilly. 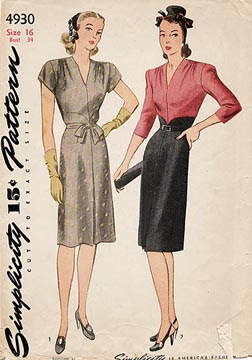 Sparkledonkey: Vogue patterns sells re-issues of vintage patterns from the 1930s and 1940s. People who read this blog, who are not able to afford $75 to $125 patterns from the Blue Gardenia, but who like vintage styles, may wish to purchase patterns from Vogue @ $3.99. It's rare that Vogue patterns go on sale like this. (Normally they're like $20+.) In addition VOGUE is part of this blog's focus. So yes, I do think it's quite relevant. 33% off something that is outrageously expensive to begin with is no bargain. I'm sure Neiman Marcus has some things marked off at 33% off right now, but I'm not shopping there either. I'm sorry the Blue Gardenia is hurting. But really, if you feel that bad and want to help out, why not just send her a check directly? Send what you can--no need to buy a pattern. I'm sure she'd appreciate whatever help you can offer. Some of us have been hurting economically for years due to this recession. I can't even afford to make a dress for $50, much less buy a "sale" pattern for that much. Sorry, but the irony of someone like me (laid off since 2006--work in my field nearly extinct) spending $50 on a pattern in order to bail out someone who caters to a rich clientele, is just too much. Anonymous, I sympathize with the plight of people who have been laid off--that's why I wrote this post! Oy! I think Anon missed the point. If you can afford to help out a fellow blogger and sewer, then by all means, do so. 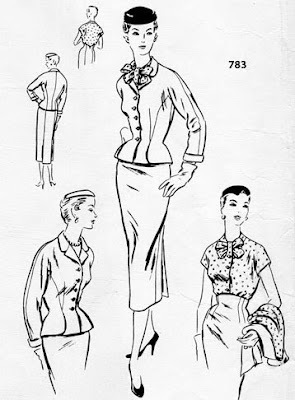 If you can't, it doesn't mean you have to plug Vogue patterns and make Gertie feel bad for trying to help someone out. I can't afford the patterns right now, either, but I did save the link in my favorites and I have been there a few times already to check things out. When I get back to work, who knows? I may splurge on one. Not everyone is completely html and Java knowledgable. Just because she didn't have a shopping cart or a searchable site didn't put me off one bit. This is all she can afford to do right now. I can sympathize, as can many of us. oooo Gertie! That suit is fantastique! It will substitute nicely. Brava! Gertie, that suit is magnificent; I think it is an excellent substitution for the impossible-to-find VoNBBS model, and I can't wait for you to make it!!! I just blew the roof off my personal most-expensive-pattern purchase record over at Blue Gardenia, by the way, and after a year of tooth-grinding, future-fretting economy, it felt damn good. I sympathize with a lot of the points that have been made, and agree with many. On the other hand, when I am ready [emotionally & financially] to bask in a deeply self-indulgent splurge, 1) I get to! 2) I'd rather my hard-earned money goes to a small business or individual than a large company. Usually somewhere like Etsy- but for the really rare, amazing, prewar looks I was fantasizing about, a specialist shop is perfectly appropriate. Thanks to Gertie & Carolyn for the link. With this purchase and patterns coming shortly from Colette Patterns, 2010 is going to be the most amazing sewing year, and I can't wait! !